I have been so excited (and nervous!) to share this post with you! 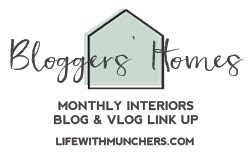 Today I am joining in with 26 other amazing interior bloggers, with the 2nd #UKHomeBlogHop. The first one was our Christmas Home Themed #UKHomeBlogHop which was such a great success, we wanted to do it all again! 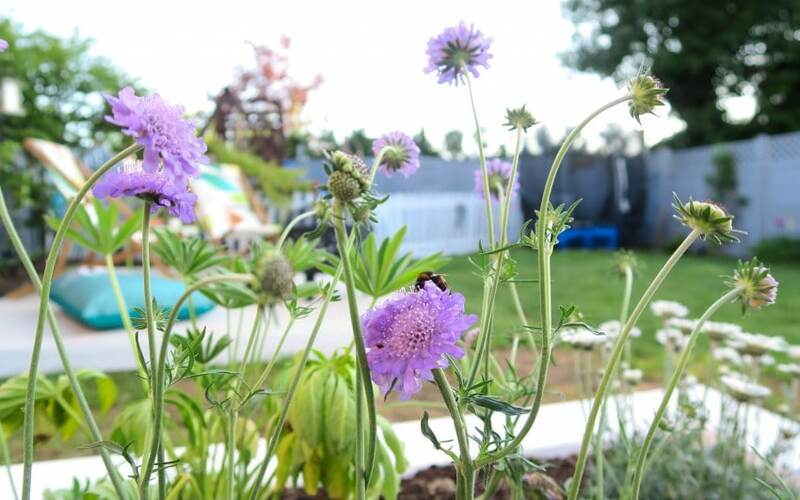 Kimberly from SwoonWorthy started off the bloghop on Monday when she shared her Summer Ready Garden, and has been busy organising this great bloghop too. If you have arrived at my blog from Maxine at We Love Home, Hello, and Thank You for hopping along! I’m Steph, a Home and Family blogger who fell in love with home interiors when we purchased a 1960’s time warp a few years ago. Take a look at my About Me page if you want to find out more about us! We have been busy renovating every room of it, and turning it into our family home. So now it was the gardens turn! Back in 2012 we moved into our house, and it needed a lot of work doing to it. 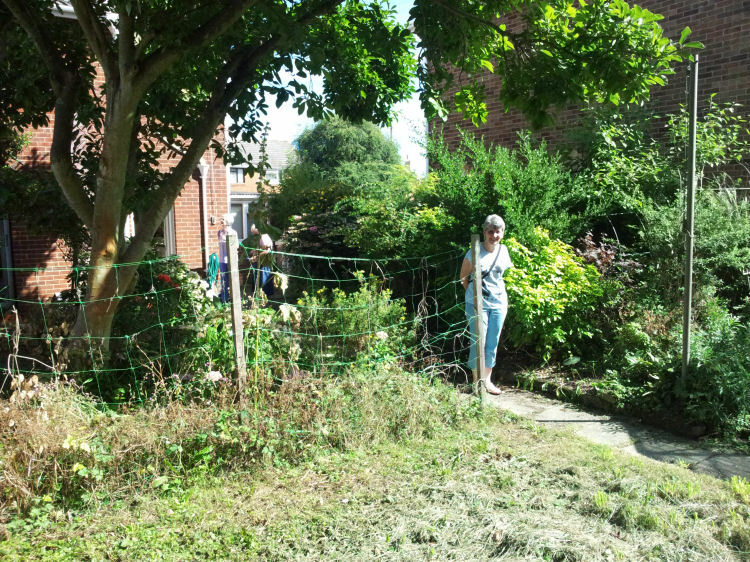 The garden was very overgrown, and FULL of plants, weeds and flowers. It just didn’t work as a family garden. 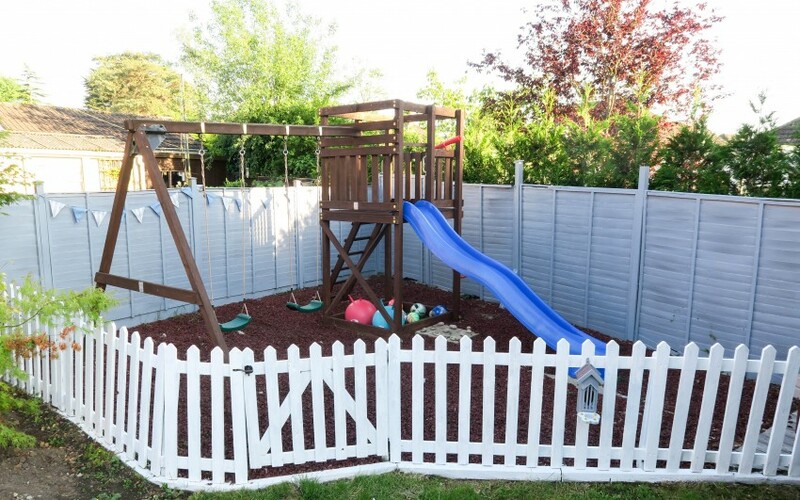 Being a Mum of 3 children, I wanted a space where the kids could be safe, fun and somewhere for them to play outside. We purchased a climbing frame from eBay, and turfed over the garden. It gave us what we needed, but it never was how I wanted it. With dark fences, a massive flower bed that I could never keep on top of, and old concrete slabs. 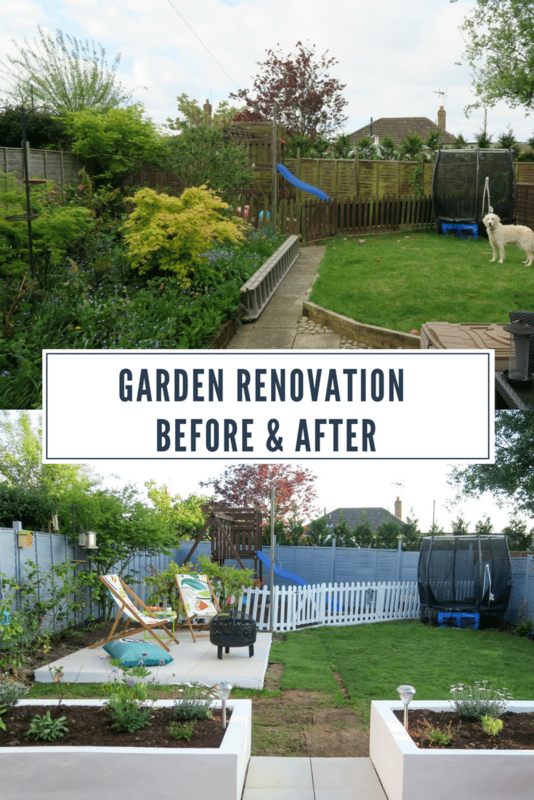 We have worked our socks off, if you are one of my readers who follow me, you would have seen our weekend in pictures posts have been full of gardening! Anyway, you just want to get on and see the after don’t you! I am going to give you a little tour of everything we have done, I really hope you like it! *Just one thing, please excuse the dead grass. we purchased some new turf and when we laid it, it looked very scorched and dead looking! So sorry about that, things never go to plan do they! What do you think?! Big change hey! 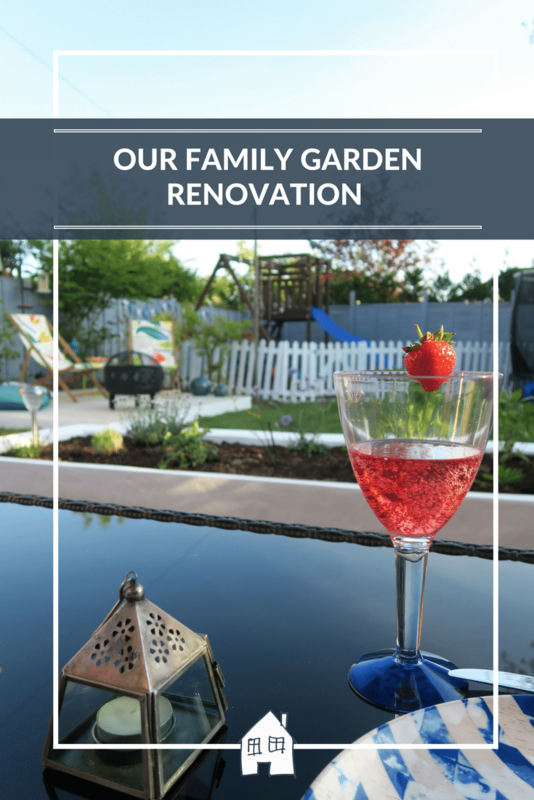 We wanted our garden to be a space that we could all enjoy as a family. 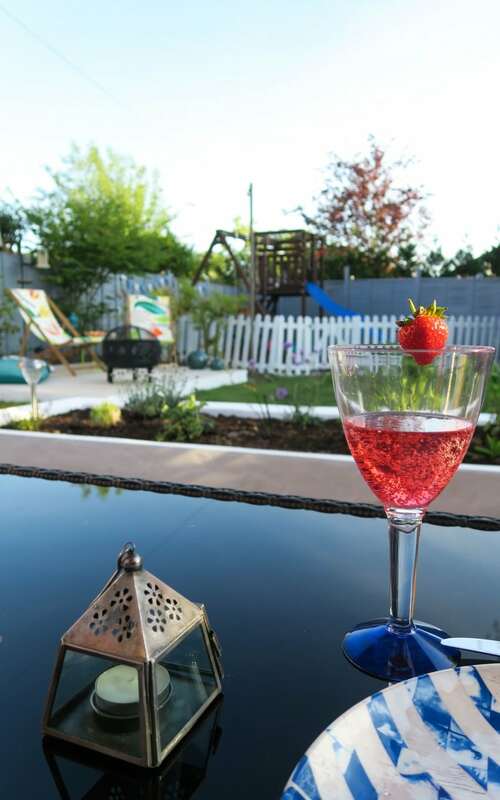 With the kids being able to play, to seating areas for us to relax in, and more inviting to sit outdoors. I really want the kids to want to spend more time out there. Not just for playing, but to go and read a book out there, or do their homework. We had a very large, flower bed in the above space. It was so difficult to keep on top of, the plants would grow like mad, and I would have to weed the jungle. 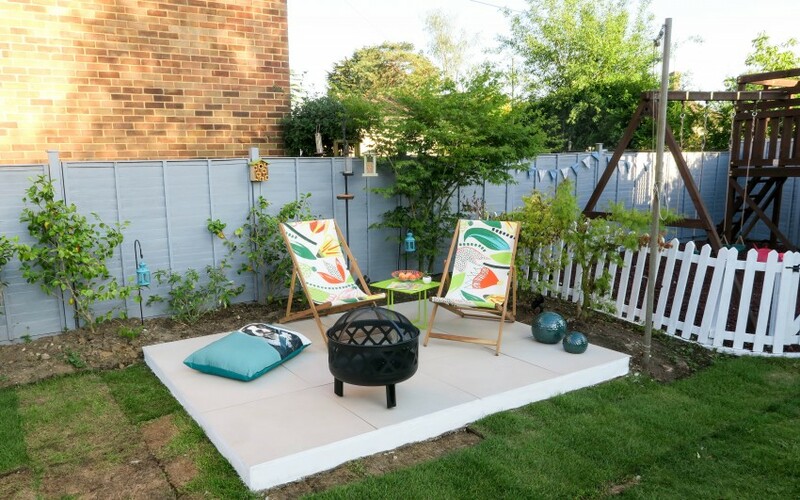 We can now use this space to relax in, and how lovely will it be in the evenings, to be able to light this Tara Firebowl, sit here with the kids and roast some marshmallows! The moment I got it out they were after getting it lit, and toasting the marshmallows. I already have a outdoor cooking board on Pinterest going for recipes! *Ignore the feet on the firebowl around the wrong way, I screwed them on the wrong way around, and only realised when I was editing the pictures!! 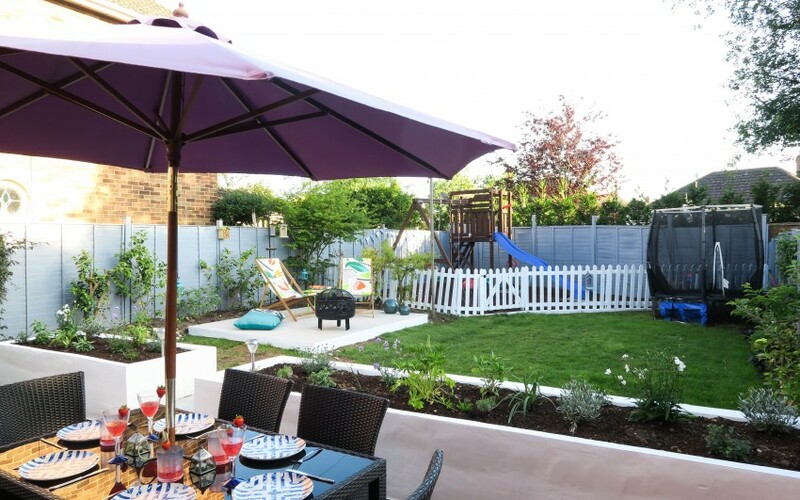 I loved the idea of having two seating areas in the garden, one for dining which is directly outside the back door. Then another one for chilling out at. I may add an outdoor sofa into this area, as it would be perfect. I can see lots of evenings out here with hubby, relaxing and getting away from screens and ‘housework’. I wanted the flooring to be something special, so I picked these Dunsen porcelain tiles from Tile Mountain. They are huge (my poor husband laying them!) but really nice, and give a wow factor. We will be laying them all over the large patio, outside the back door as well. 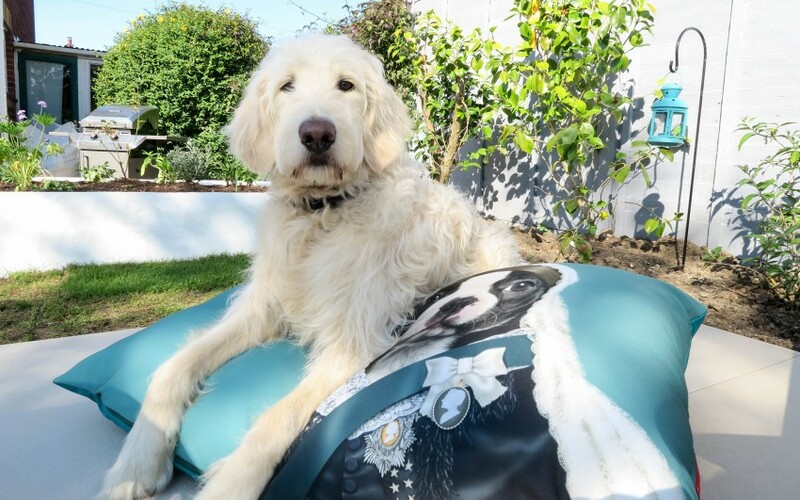 Gus of course wasn’t left out, the lovely people at We Love Cushions sent him his very own dog bed, made from wipe down water resistant fabric, it’s perfect for him to relax on outside with us. Whenever I sit down somewhere he will always come and relax with me. Now he can relax with ‘Queen Vic’ and me too! 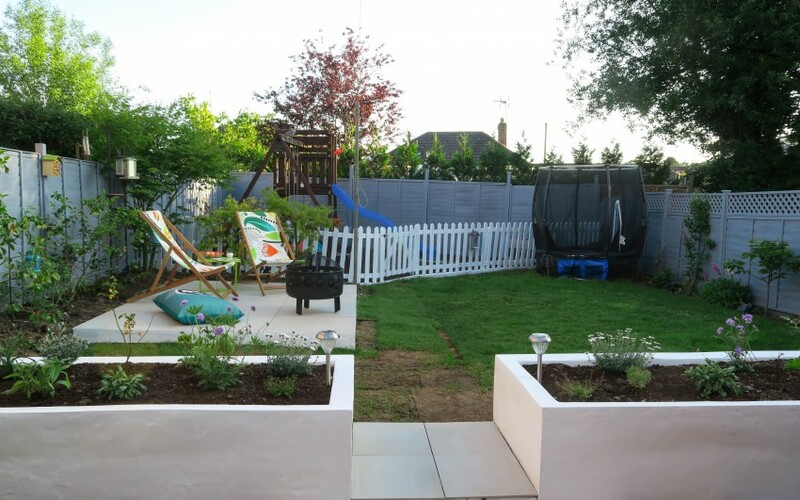 I wanted to section these spaces off, so by adding the large white rendered planters across the width of the garden, it creates a good way to section it all. 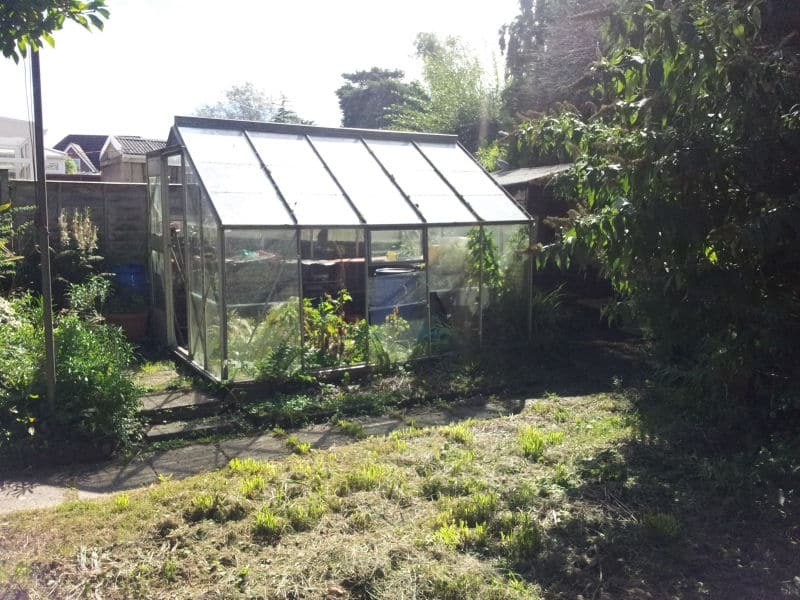 Once the plants are established, it will provide a good screening to look out over the garden. This area is perfect for eating Al Fresco! Right outside the back door, we can easily bring out the food and drinks. With 3 kids, I stick with plastic plates and cups! These ones were from HomeSense last year, but they always have a great selection of homeware. I’ve added lots of plants into these raised planters, they came from B&Q, Suttons and Dobies. I also have added in plants that were from the old flower bed. Added them into the new planters, and the new flower bed against the fencing. It was the wrong time of the year to move plants from existing places, however I go on the theory of ‘I don’t want it in this space, so if it survives then a bonus!’ So far so good! The planters will look so good when they all come out in flower, and start filling out the planters. I have gone for flowers that are whites, blues and purples to co-ordinate with the colours of the landscaping. I’m sure you have noticed, but we have painted the fences! 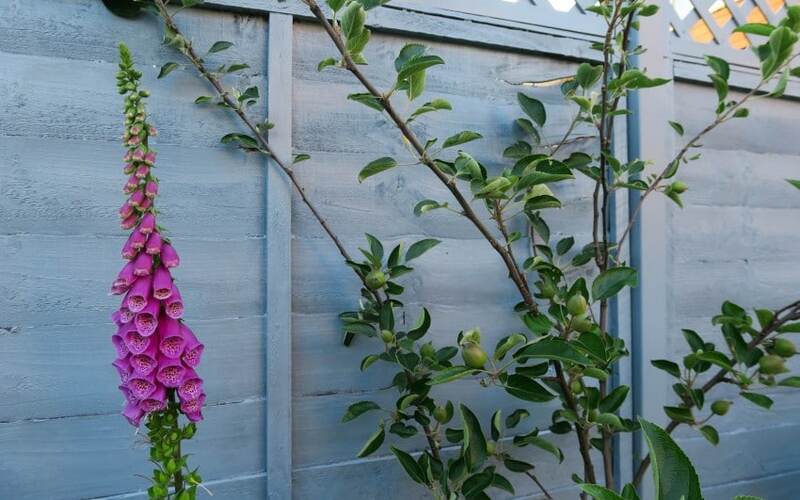 I wanted a completely different colour to my fences, something not everyone has. So I think I managed that don’t you think! I used Johnstones Colours ‘Night Shore’, which was fantastic. 2 coats covered them perfectly, and I love that the paint leaves the fencing with something like a waterproof protection on it. The rain just sits on the paint. This would be perfect for protecting your wooden items in you garden. 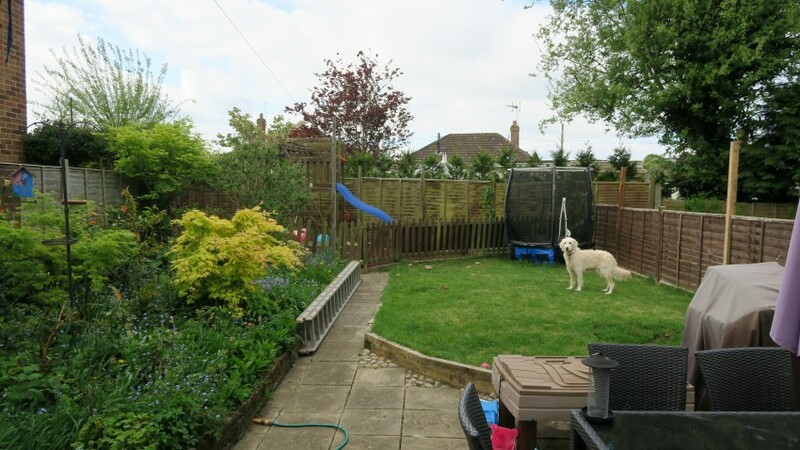 I had a mixed bag of reactions about my chosen colour when I said I was going to paint my fences grey! When I first started painting the Night Shore paint, I was very surprised to see it was quite blue. I did expect a more light grey, however it has really grown on me. I like the contrast against the white rendered walls, as it is a warm bluey grey, and I LOVE how the colours of the plants POP out at your now too. 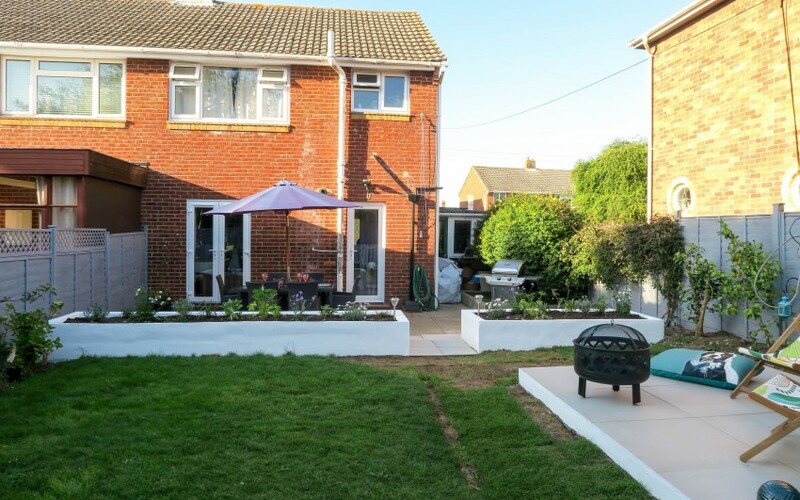 I also used the Johnstones White Masonry paint to paint the rendered planters, and around the base of the new patio area. I really good paint for coverage, and I think they look really smart. I am going to paint and waterproof covering over them though, as they do attract the dirt, and bird poo! 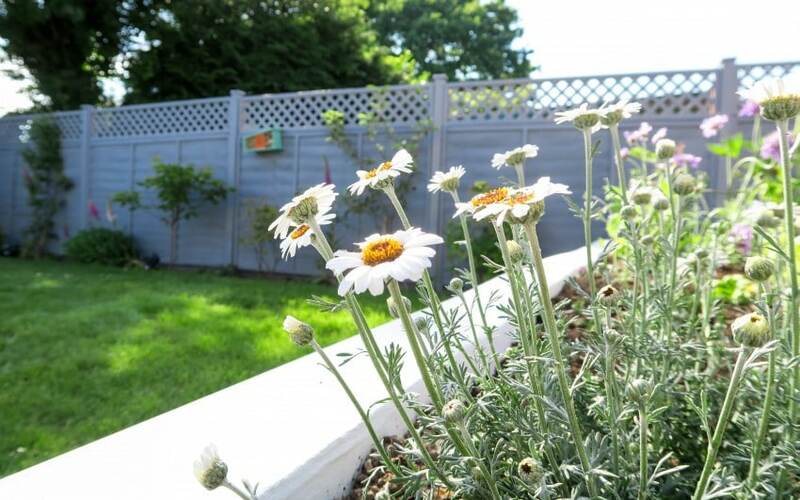 Wildlife plays a big part in our garden, I want to encourage the bugs, bees and birds into the garden. The girls get so excited when they see a Butterfly, and trying to spot the colours and marking of them. They have named the birds too, although don’t tell them it probably is different birds coming in each time! So with that in mind, we included some little houses for them. A Orla Kiely bird box, Butterfly house, large bird feeder, and a bug motel. Perfect places to hide away, and create their homes in. Then at night the garden wakes up! 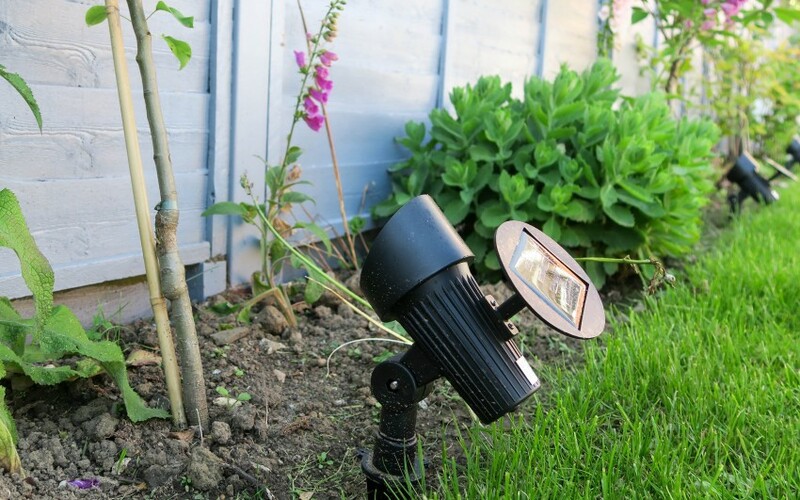 I picked up some solar spot lights, that I have placed around the garden, you can focus them onto certain plants, areas, or things you want to light up more. The each have their own solar panel, so you aren’t restricted on where they are placed. They are a soft light, which looks really good at night, I think I want some more! 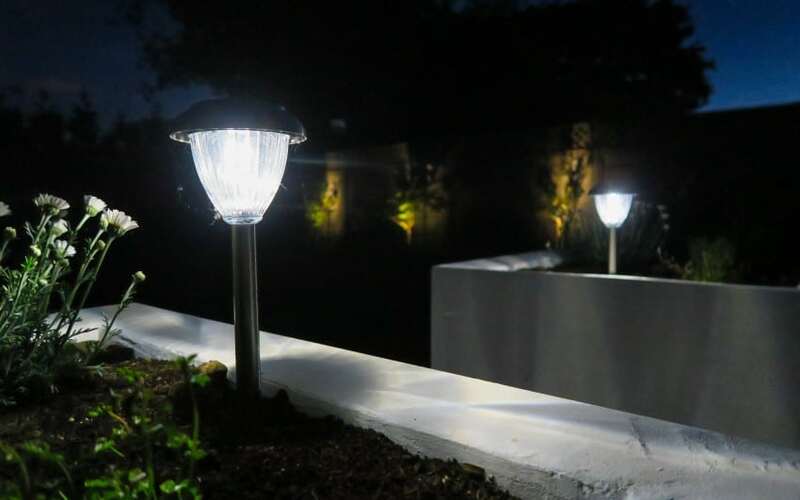 I also choose some pathway solar lights to be placed either side of the path, these are really bright and let off a great amount of light, so great for lighting up the step. All these were from WayFair. We have worked so hard in this garden, we do everything ourselves, and my amazing hubby deserves a medal. The amount of building work he has done, and building 2 huge planters from scratch, when he has never built a wall before, is outstanding! Massive Thanks to Hubby! Now please do hop along to Fresh Design Blog to see what she has been up to! Don’t forget to check out the Hashtag #UKHomeBlogHop on Instagram and Twitter as it is such a pretty feed to find some great ideas from. Also Thank You to the fantastic brands that worked with me on this project. I received the following items for the purpose of this post. However all opinions are honest and of my own. Plants from Suttons and Dobies. Oh you did such a good job with this! Such a master piece Steph! I’m hoping our garden will look like that eventually. This looks lovely and love Gus on his cushion! Oh yes, he LOVES his cushion! Thank you! It looks so much bigger, and much easier to keep on top of it as well. Thank you, we are already enjoying the garden more and we can now relax! Thank you, we’re super pleased with it! Jeez, it looks like a totally different garden. How much work have you done?! Blimey. I think you’ve struck the perfect balance in terms of a cool, relaxing but family-friendly space. And I love the colour of the fence. I’m glad it’s grown on you. Thank you, we worked super hard so I was glad it all came together! Everyone has been so kind about the garden, and love what we’ve done. I think being a bit bolder paid off! Ah thanks, I have always wanted some raised beds like this forever! OH WOW. You must be so proud! It’s a stunning space and a place to relax and have fun. Thank you, super proud of it, and looking forward to the summer! Oh, wow! Your garden looks absolutely amazing. I wish we were creative enough to be able to do something nice to our garden. Thank you, I have since broken my deck chair after sitting down and enjoying the garden! Thanks! I’m glad it has give you some inspiration for your garden. Thank you, it was hard work, but it was worth it. Now we can relax in it! Thank you, it felt like such a big job but completely worth it in the end. We now can enjoy it, and relax! I love the colour of your fences. I’ve been thinking about painting ours for a long time, and you’ve really convinced me. Now I just have to convince my husband. 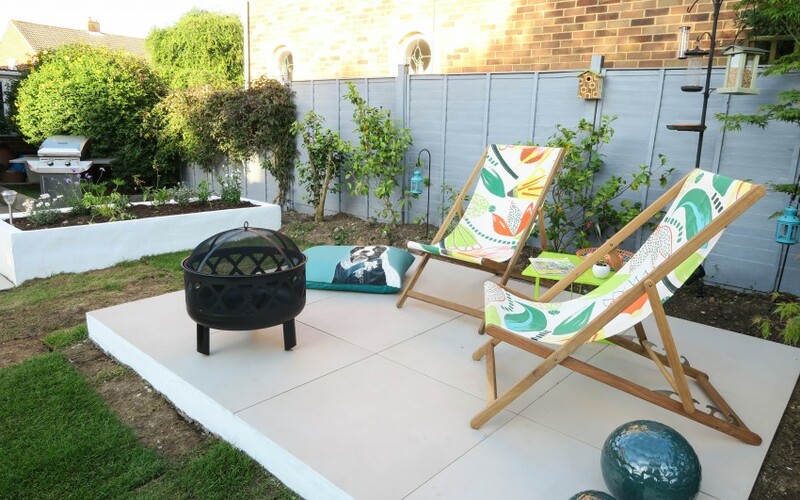 The patio slabs are amazing too – they look so stylish. The garden looks brilliant. Thank you, the fences make such a difference don’t they, this paint really protects the wood too. Maybe hubby will love that plus point! WOW! What a transformation!! 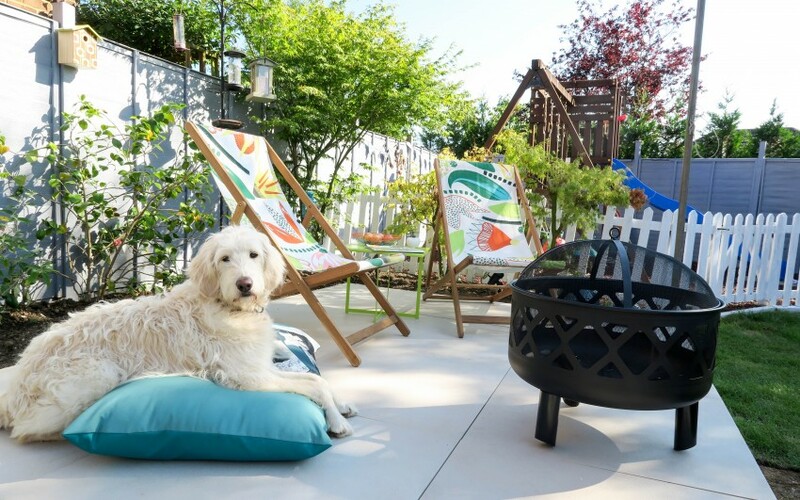 Your garden furniture is amazing, I love those deckchairs!! Oh wow! What a transformation! 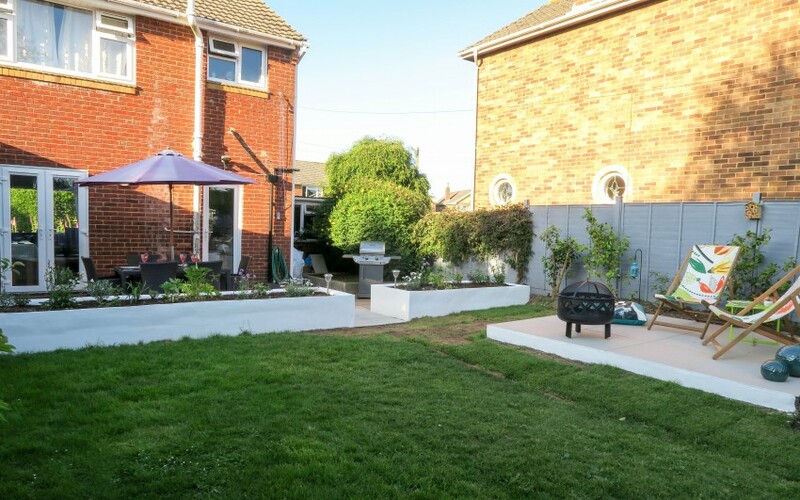 Love what you did with your garden, looks so much spacious. Thanks! It looks so much bigger doesn’t it! Thank you, we certainly will be spending more time out there! Wow you really have transformed that into a beautiful garden. It looks like you are all set for summer now! Thank you, now we can relax! Thank you very much, the kids LOVE the play are. Best investment we have ever made! Oh wow, this is beautiful. I would lovey garden to look like yours. Ah thank you, first time I’ve had a proper ‘grown up’ garden! What a transformation. 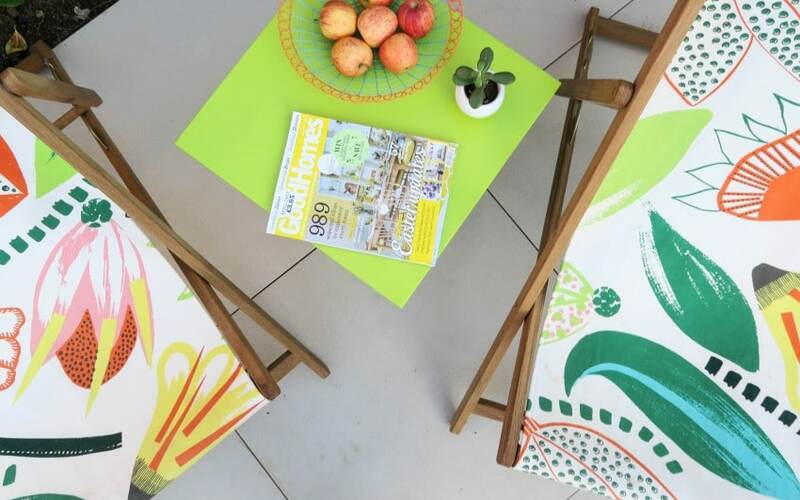 The deck chairs really add a pop of colour to the space. Thank you, yeah they are nice aren’t they, until I sat on one yesterday to finally relax and I broke it!! oh my goodness that is such a fab transformation, i love it all and especially that there is something for everyone! Wow, what an amazing job you’ve done. 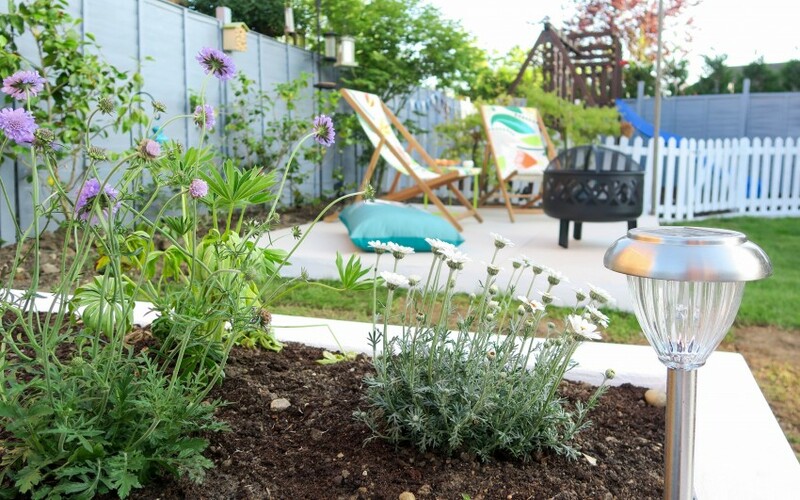 Your garden looks stunning and so inviting. Enjoy it this summer. Thank you, I am really looking forward to relaxing in it now! Gosh you’ve made such good use of the space! I bet the kids love it. And I adore all the dots of colour! They are already using it more, and not just to play in. Result! Wow Steph this looks brilliant I’m always amazed by what a coat of paint can do! I also love how you have zoned the areas! Thank you, I am so pleased the fences got painted, makes a massive difference. He is a cutie! Oh wow, your garden looks absolutely incredible! So much open space and something for everyone! Bet you’ll have tons of fun in it this summer! Can’t wait to make use of it during the summer months, we can enjoy it now! Wow amazing what a change it looks incredible….fantastic work loving every aspect of it particularly the separate chill out area! Just gorgeous. Ah thank you, we are so pleased with it too. Oh my goodness, the garden design is stunning. 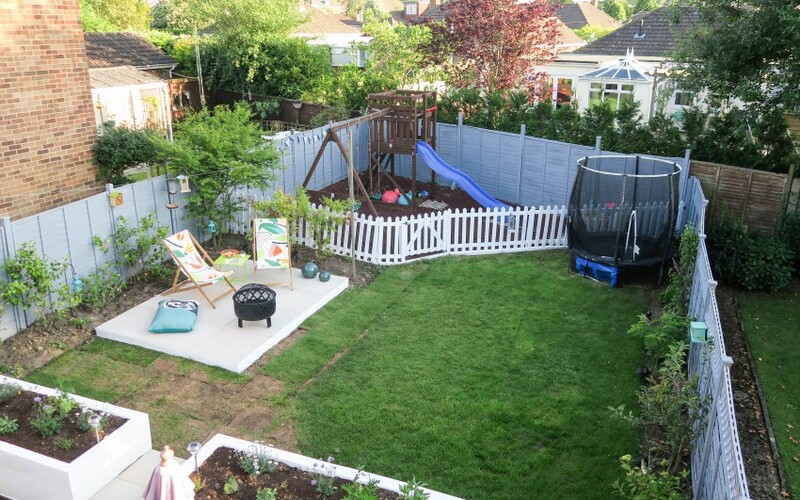 I love the play area being fenced off… it looks fab. 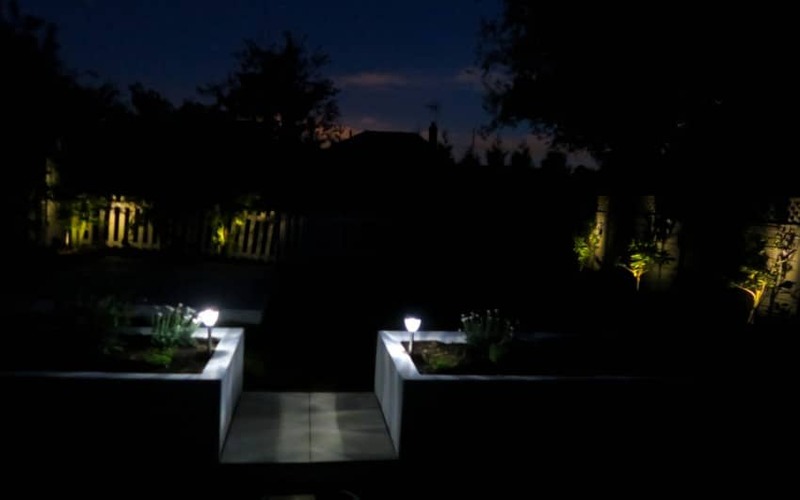 I need to invest in good garden lighting, ours are a bit ‘meh’. Thanks, yes that works great. Keeps the dog out, and all the chipping flying onto the lawn! Thank You! This paint was quite thick, so it was easy to spread around and catch before running through. Thank you, now we can enjoy it! Thank you, we are really pleased with it. He’s a cutie! 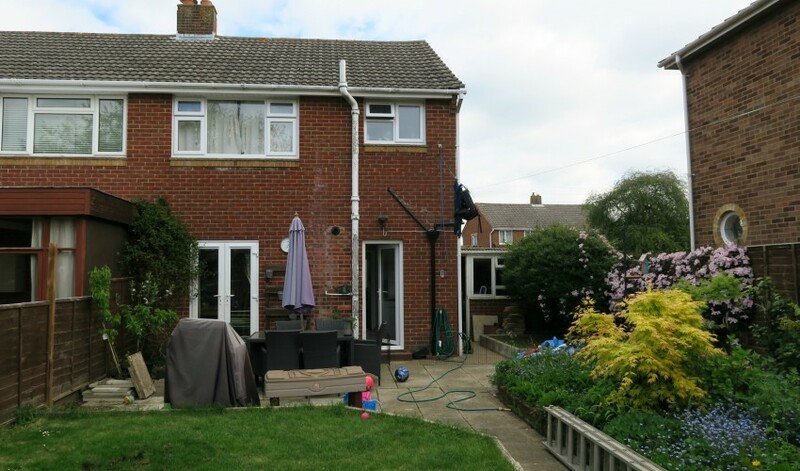 Wow, what a transformation – you’ve both worked really hard on it and it looks lovely! Thank you, blood sweat and tears! It looks so much wider now. I think you’ve ticked all the boxes: relaxing, fun, entertaining, etc. And what a photogenic dog! By the way, I have the same Orla Kiely bird box. I love it, a bit of bird home decor! Thank you very much, Gus is such a poser!! Hoping the bird appreciate the bird box!